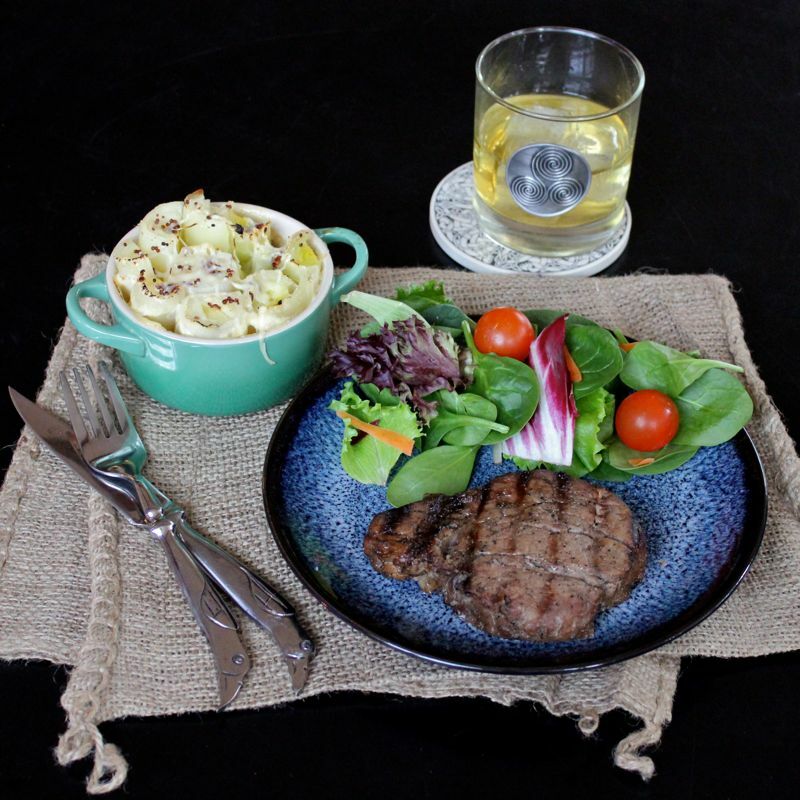 Grilled Irish Whiskey Steak & Leeks with Cream Mustard go so well together I couldn’t just give you one recipe without divulging the other. So here they both are. 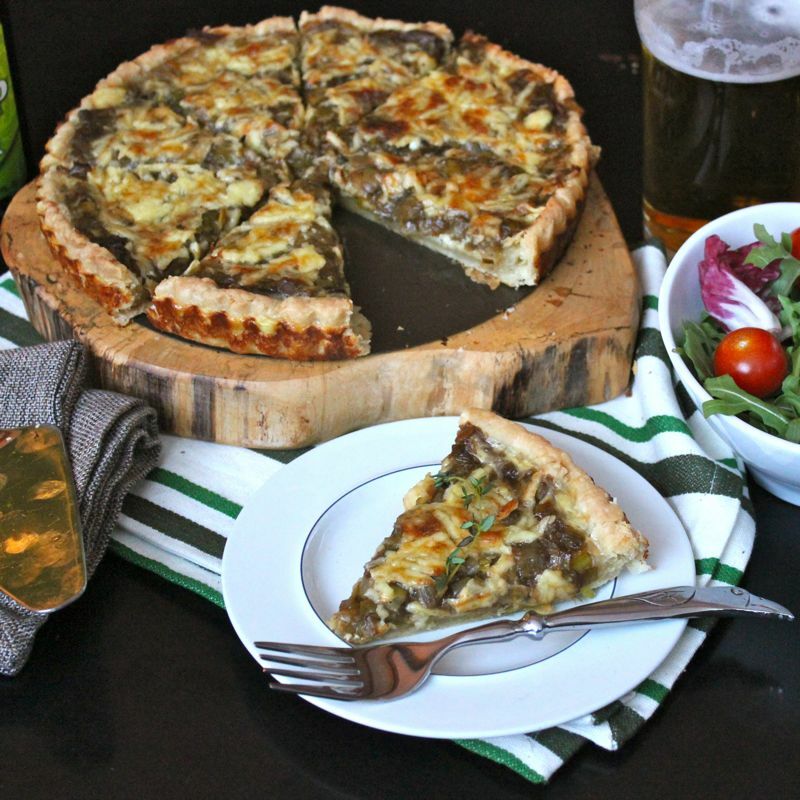 Add a small side salad and you’ll be set for a great St. Patricks Day dinner. Now let me give you a few tips on the steak preparation and grilling method. In the marinade, I used Jameson Irish Whiskey, as I so often do, I seem to have a clear bias. 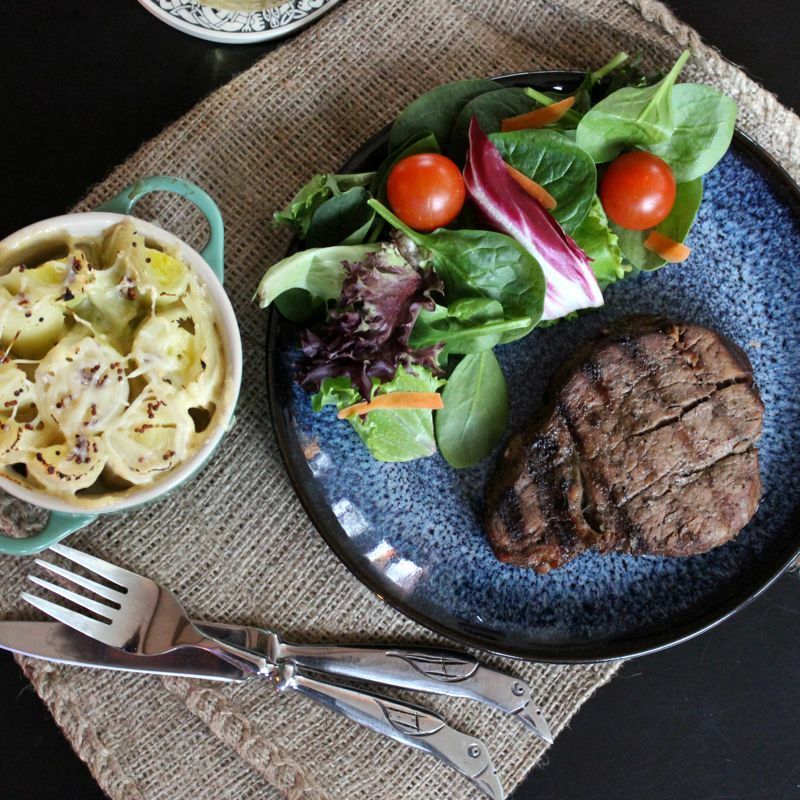 You can marinade your steaks for as little as 1 hour, but I usually try to let them marinade in the refrigerator overnight. 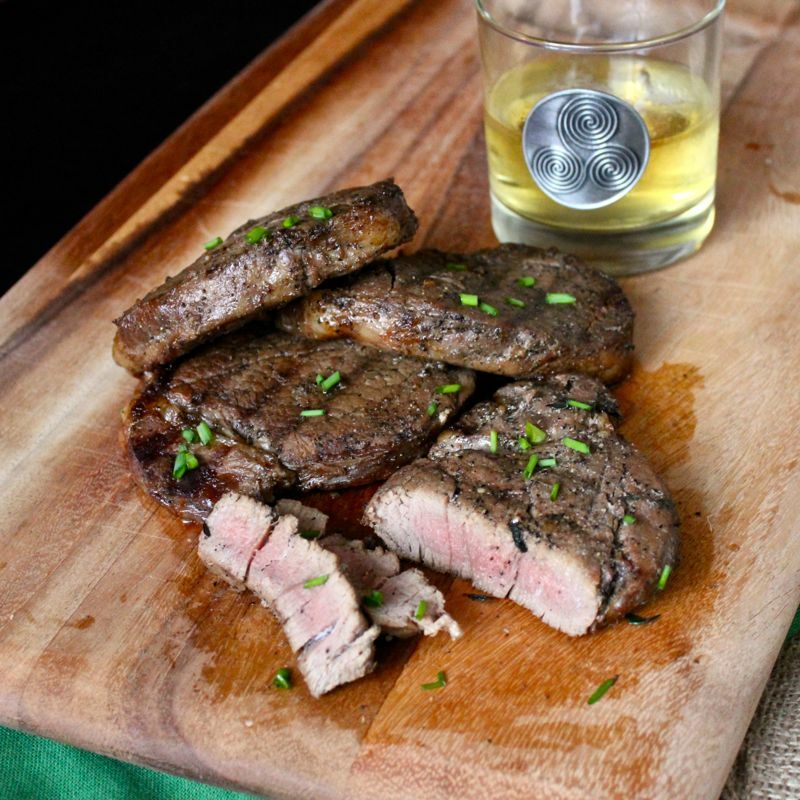 You can use any cut of steak you prefer such as flat iron, ribeye, new york strip etc. but make sure you check grilling times depending on how thick your steaks are and how well you like them cooked. The directions for grilling the steaks assume you are using a gas grill. I think steaks grilled over charcoal are better, but I just can’t be bothered messing with a charcoal grill. A gas grill is so much more convenient, I will actually use it more frequently. And the ability to more easily control the temperature of the flame gives us much more consistent results. What a second, who am I kidding here?! I never do the actual grilling. I think that is “man’s work” , what with all that lighting the grill manually when the supposed “automatic lighter” inevitably doesn’t work (hey…I once lost a good portion of my lovely fringe to a temperamental gas oven, so I admit I have some baggage here), and the braving of the hoards of mosquitos (alright, not so much in winter, but most of grilling season in Virginia they are hanging around just waiting for you to set foot outside your door so that they can pounce and drain you dry!). Thank goodness my husband indulges me in this and does a masterful job manning the grill! 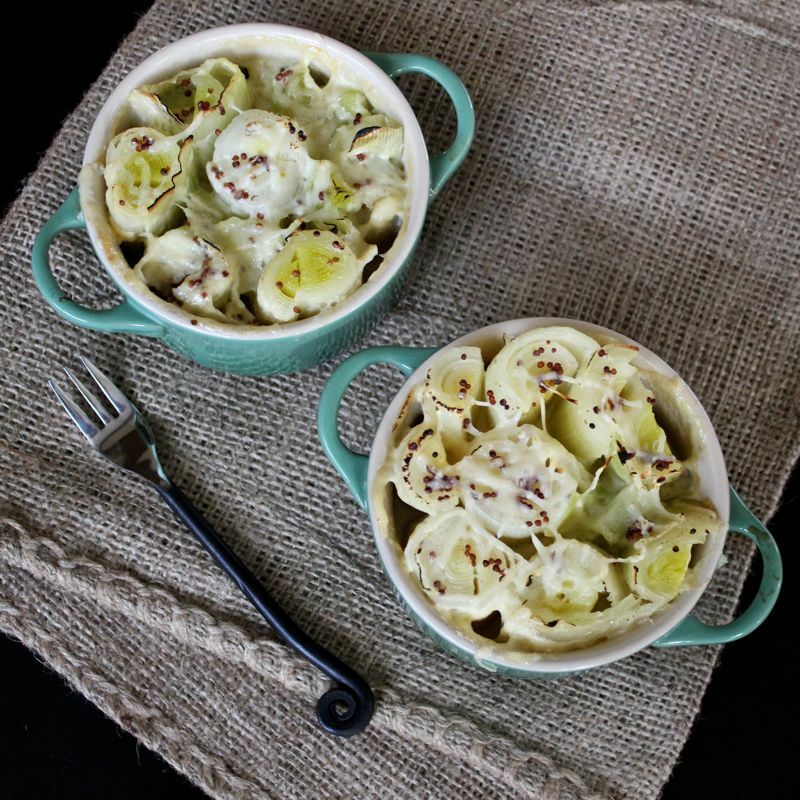 The Leeks in Cream Mustard are really yummy as well. I’m sure ya’ll have figured out how we are about leeks around here by now. 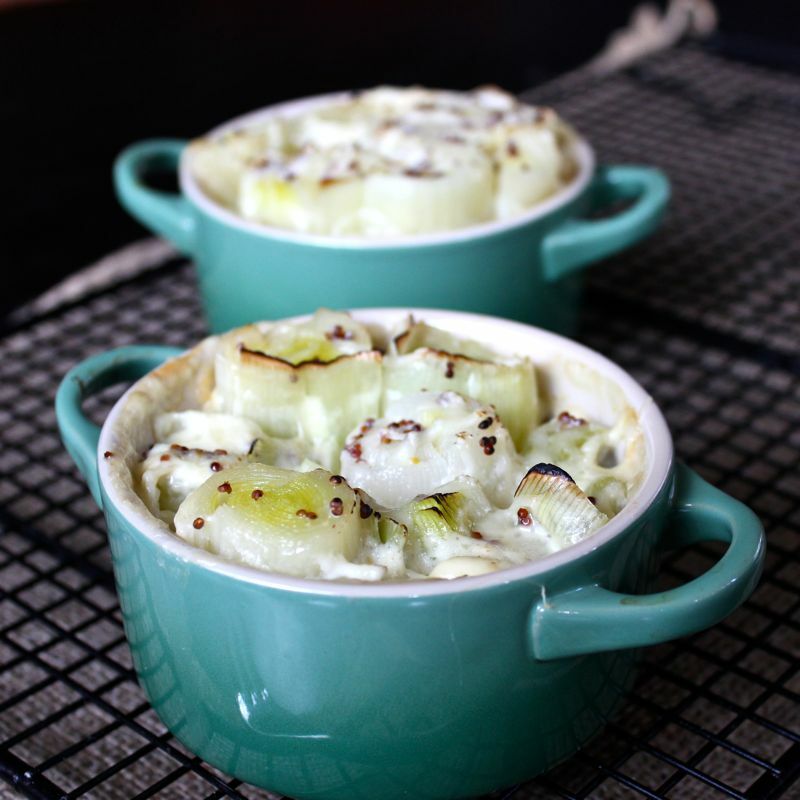 I cooked these up in little individual gratins, but you could make this in a larger casserole dish if you wished. well, I was being a bit artsy here. I thought it might look nice in the photos of the finished dish. There is no reason to do this if you don’t want to. 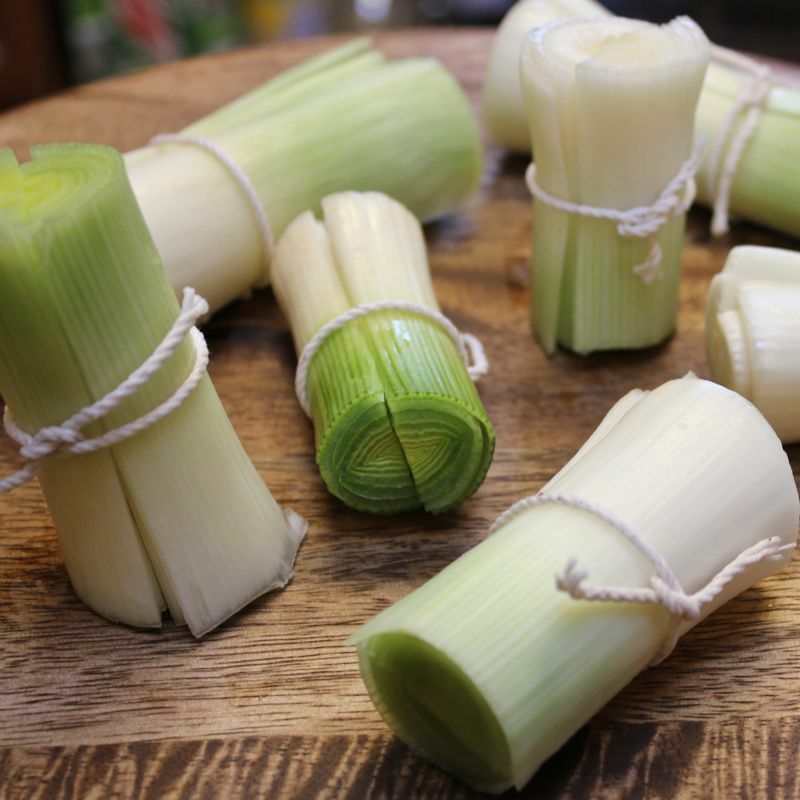 It would be far easier to just pre-cut the leeks, par-boil them, place them into ramekins and then spoon the sauce over them. I’ll let you decide how fiddle-y you wish to be on this one. There is actually a story about St. Patrick and leeks. It seems there was a dying woman that St. Patrick was tending to. She told the Saint that she had seen a vision of an herb and that she thought that unless she could find it and eat it, she would surely die. She described this healing herb to Saint Patrick as something that looked like rushes. The Saint then went outside and blessed the rushes so that they became leeks. He fed them to the woman who became healthy once again! I told you leeks were good for you! Combine the olive oil, whiskey, soy sauce, green onion, garlic, pepper, parsley, thyme and rosemary in a large Ziplock bag. Seal and shake bag to combine ingredients. Add the steaks to the marinade. Seal the bag. Refrigerate for 1 hour minimum, but overnight is preferable. One hour before grilling, remove steaks from marinade and allow them to come to room temperature. Preheat the grill to as hot as you can get it. Clean and then lightly oil the cooking grate. Place steaks on to grill only when the grill has reached its hottest temperature. Sear the steaks, approximately 2 minutes on each side and then turn the grill down to medium heat to finish cooking. Check internal temperature of the steaks after they have cooked for 8 – 10 minutes per side for a 3/4″ – 1″ piece of meat. The internal temperature for a steak cooked to medium is 140° F.
Remove steaks from grill and cover with two layers of aluminum foil. Allow the meat to rest in a warm area for 10 minutes prior to serving. Wash the leeks. Use only the white part. Cut the white stalks in half and carefully rinse with cold running water. Cut each stalk into 5 pieces. Tie the individual peieces together with kitchen twine, so that they don’t fall apart during the par-boil. 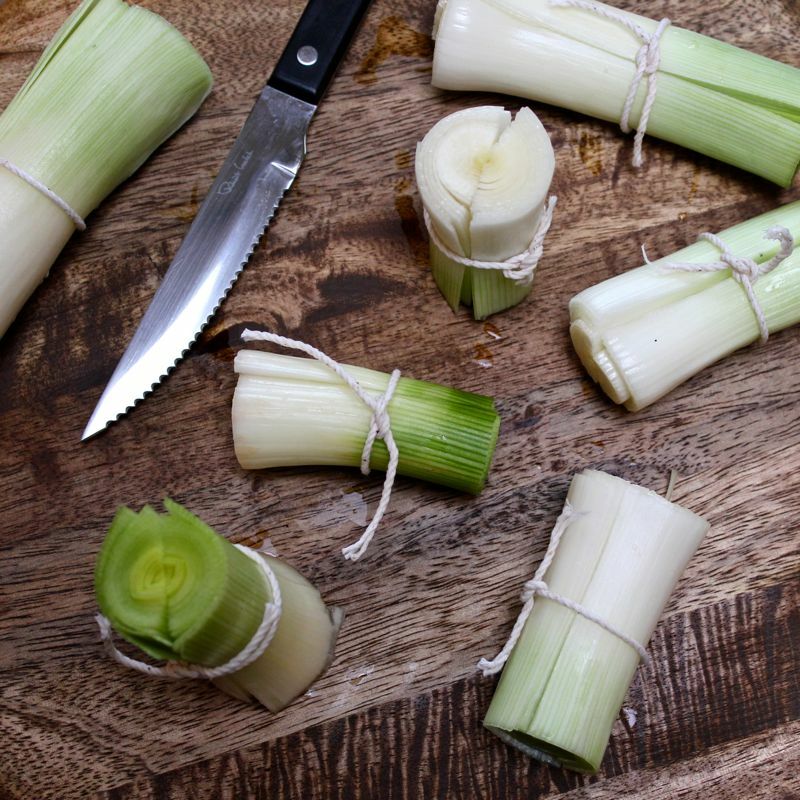 Or if you don’t want to be too fussy, just slice the leeks into smaller pieces and don’t worry with the twine. Bring the chicken stock to a boil then let it cool. Whisk in the cream, mustard, nutmeg and parmesan. Add salt and pepper to taste. Par-boil the leeks for 3 minutes in salted water. Stop the cooking by rinsing them under cold water. 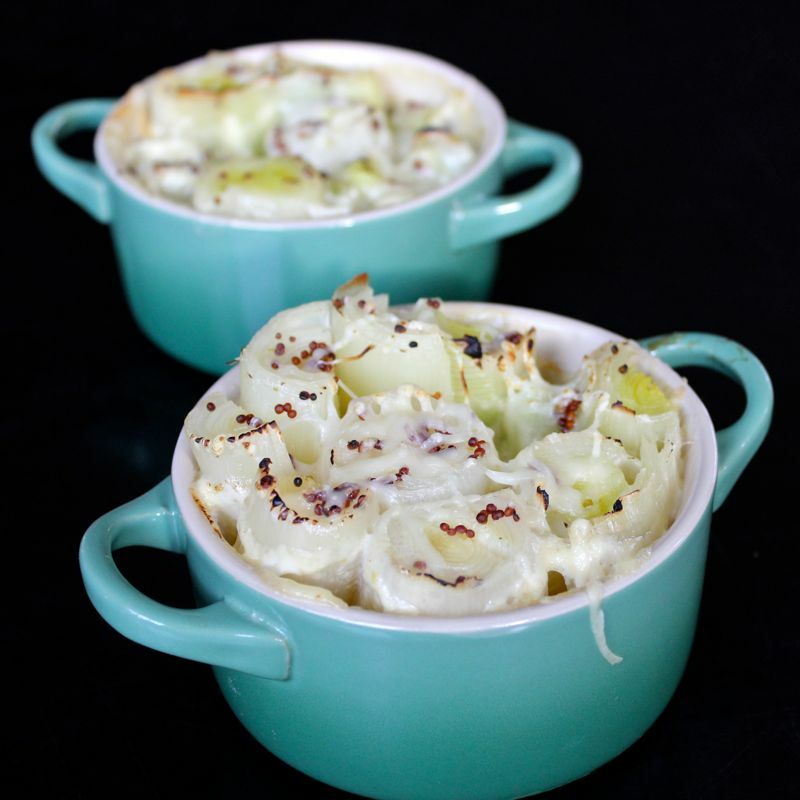 Divide the leeks between 4 mini cocottes or ramekins. Pour several spoonfuls of the mustard and cream mixture over the top of each one. (until leeks are mostly covered) Bake for 20 minutes or until top is just starting to brown a bit. 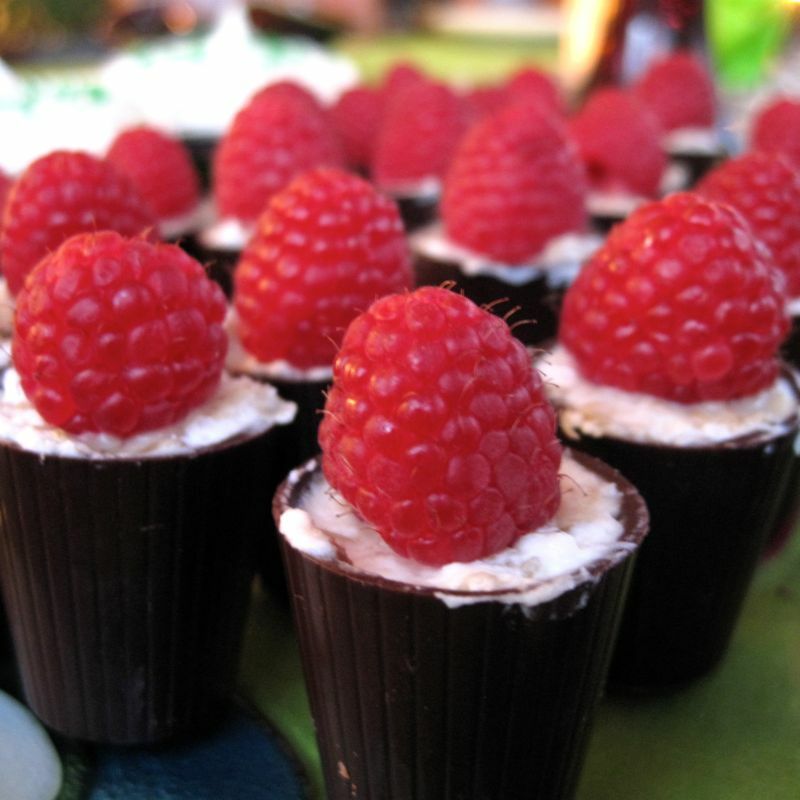 Serve hot and bubbly! Now what you’ve got here is a big, hearty bowl of comfort! 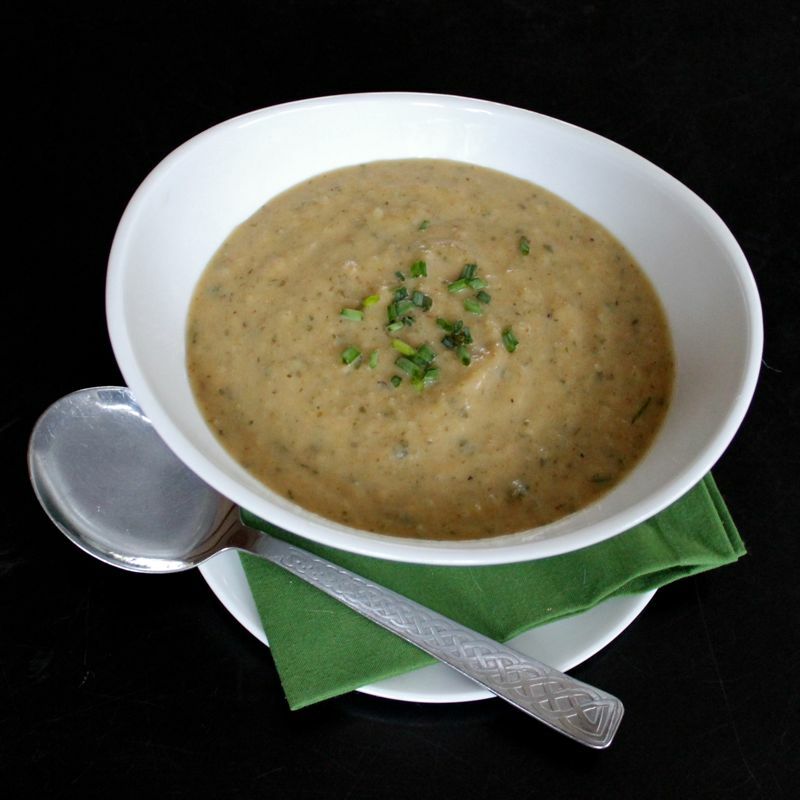 Roasted Potato Leek Soup will really warm you up this winter. And yes…it is still winter. It snowed yesterday and I hear it will be snowing again this Wednesday. And we haven’t had any cool snow at all this winter. You know the scenario where there is just enough snow to make everything look pretty and get work cancelled yet a small enough amount that it’s completely melted in a couple of days? No, all that has shown up this winter are trifling little wet flakes that don’t amount to anything and are just plain annoying. 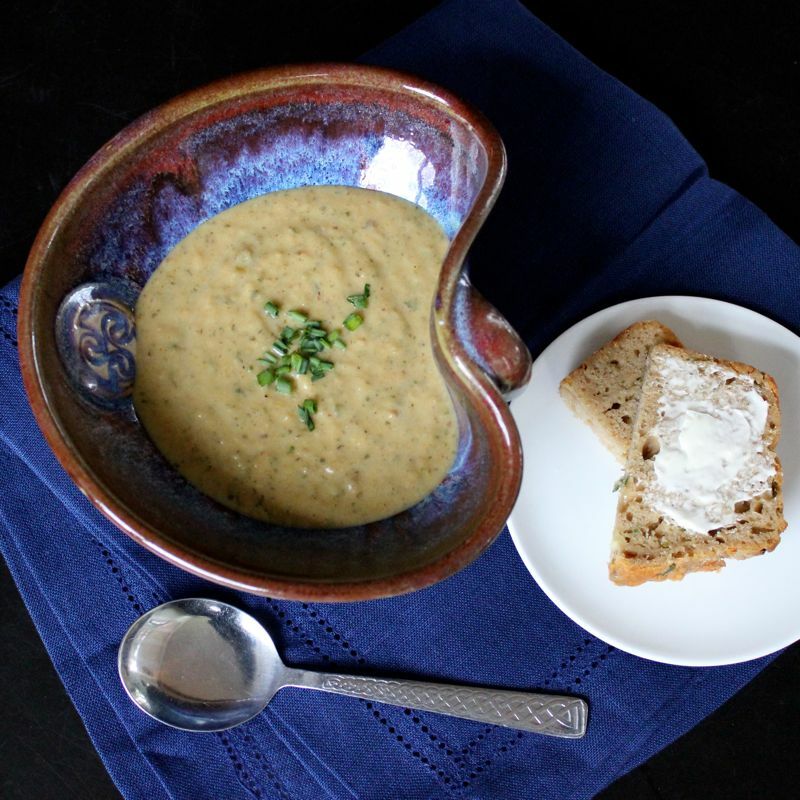 Having a big old pot of this rustic, delicious soup goes a long way toward soothing those winter frayed nerves. 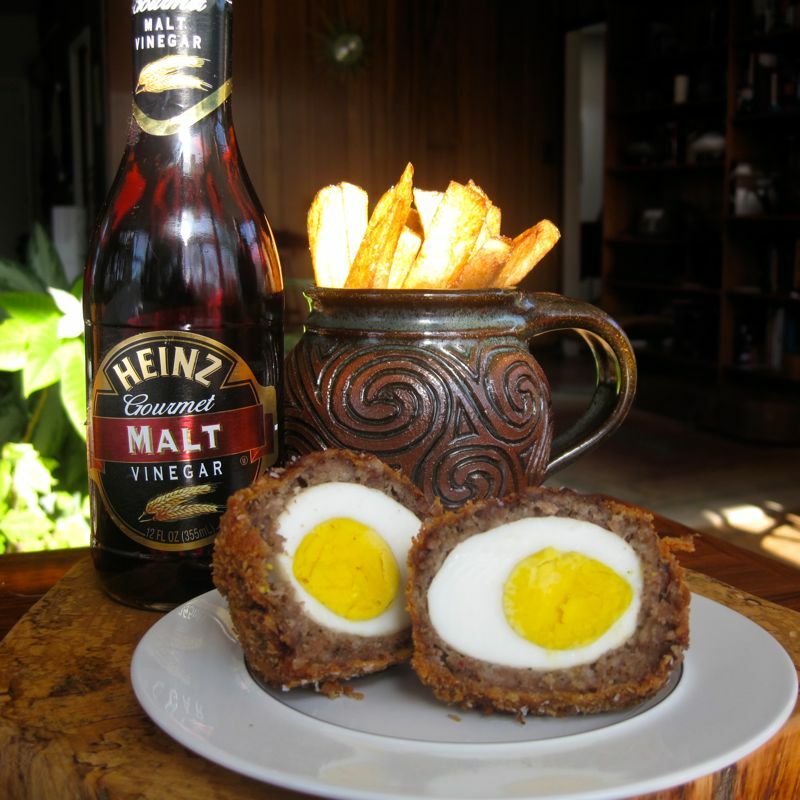 I have eaten many a bowl of it in Ireland and thought it would be great to add to my St. Patrick’s Day countdown. But this soup is a little different from many of those which I consumed in various pubs across Ireland. In this creation, the potatoes and leeks are roasted before being added to the soup, which really enhances their flavours. And this lovely soup also has a surprise ingredient in it, Arugula or Rocket as it is often called in Europe. ( I think Rocket sounds better than Arugula, so I’m going to go with that for the rest of this post). When I first came across this recipe, I must admit, I was a bit skeptical about the addition of Rocket, but decided to go ahead and give it a try. I’m so glad I did because that peppery taste of that herb really adds that extra something to this vibrant, fresh tasting Potato & Leek soup. Oh and white wine, cream and parmesan cheese also show up in the list of ingredients, so you know this soup has to be unbelievably tasty! 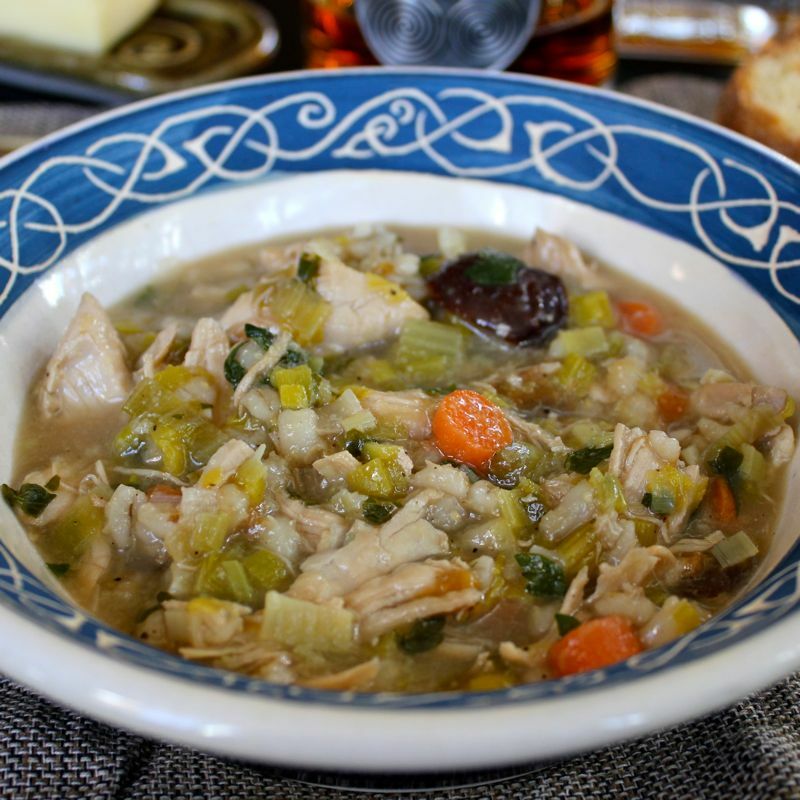 As it turns out, this soup not only tastes fantastic, but it is also good for you. Right now I’m sure you’re thinking, “yeah right…a cream based soup is good for me”. But I’m telling you it is. 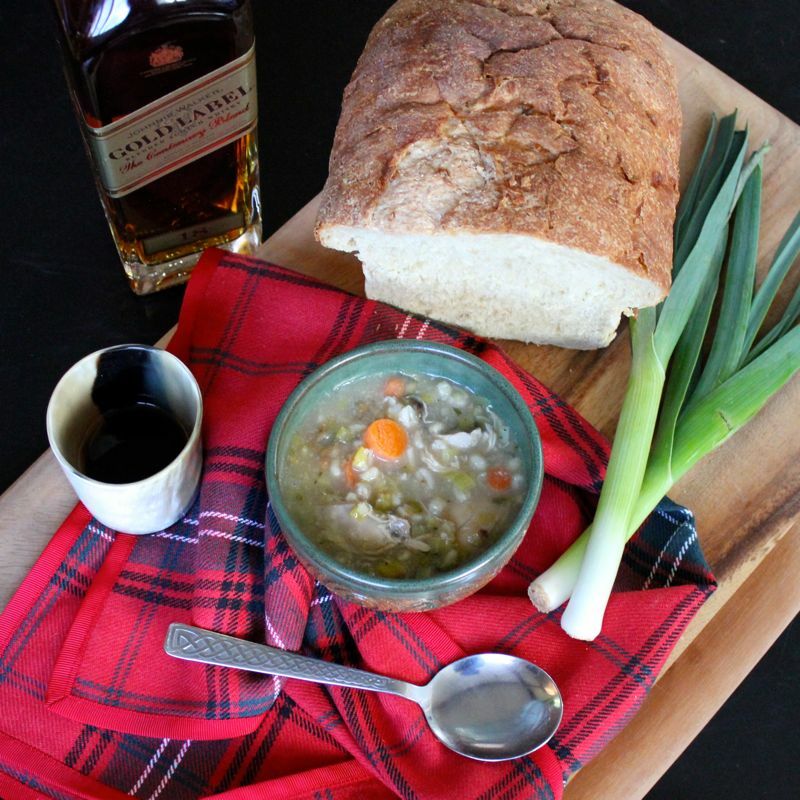 This soup has leeks, which everyone knows we love in this house. 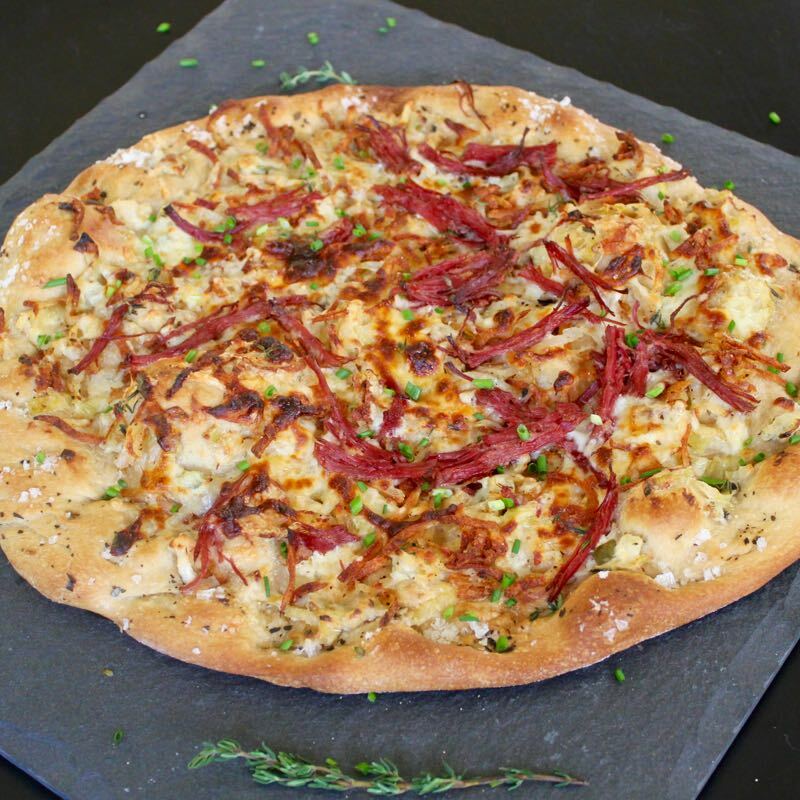 Leeks are part of the Alliaceae family along with garlic and onions. But leeks have a much more delicate, sweet flavour to them than their better known cousins. They are actually one of the most nutritious winter vegetables to be had. They are high in fiber, a good source of antioxidants, folate, vitamin C, B6, K, manganese and iron. I can tell your eyes are glazing over a bit now, but hang in there for just a second. Some of the health benefits of all those things I just rattled off are, lowering and maintaining healthy cholesterol levels, lowering blood pressure and risk of Coronary Artery Disease and lowering the risk of low-level inflammatory states like diabetes and rheumatoid arthritis. Pretty impressive list huh? But besides leeks, this soup also has a bunch of Rocket mixed in. Now Rocket has been grown as an edible herb since Roman times and was rumoured to be an aphrodisiac! Virgil states that “rocket excites the sexual desire of drowsy people”. It was likely this belief that lead to the prohibition of its cultivation in monastic gardens in the Middle Ages. Rocket has a rich peppery taste and is often eaten raw in salads, and it is actually a much more nutritious choice than most other salad greens. For instance, when you compare it to iceberg lettuce, you will find that Rocket has 8X more calcium, 5X more vitamin A, C and K and 4X the iron! Wowza! And although most folks do think of it as a salad green, it is actually classified as a cruciferous vegetable such as broccoli, cauliflower and cabbage. These type of vegetables aid in the regulation of your immune system functions, which can protect you against cancers. Not to mention, like Kale, it is a good source of antioxidants. So there you have it! 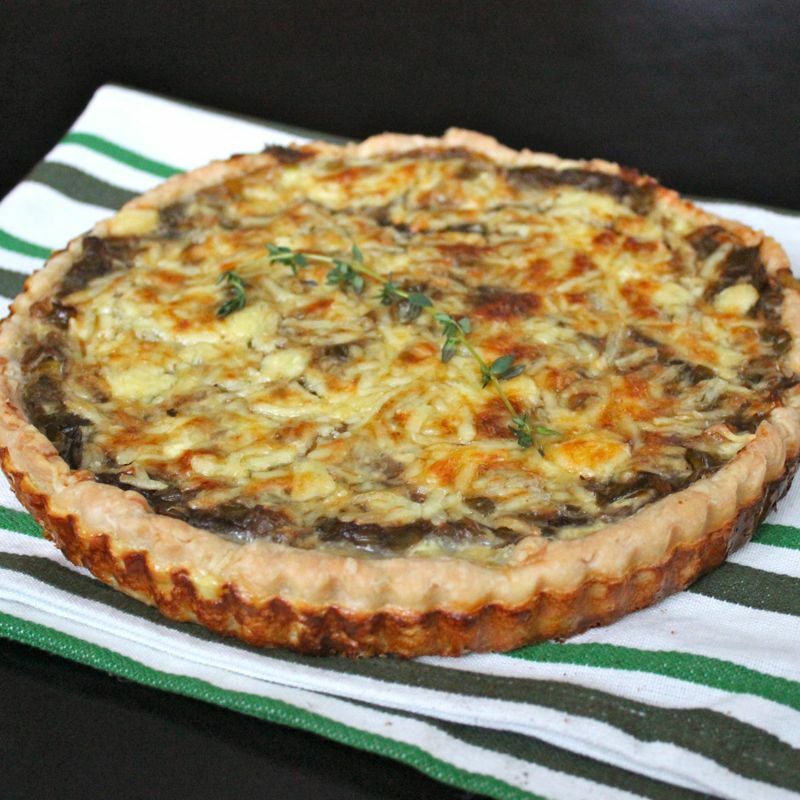 Healthy, Delicious and comforting! A combination not often found. 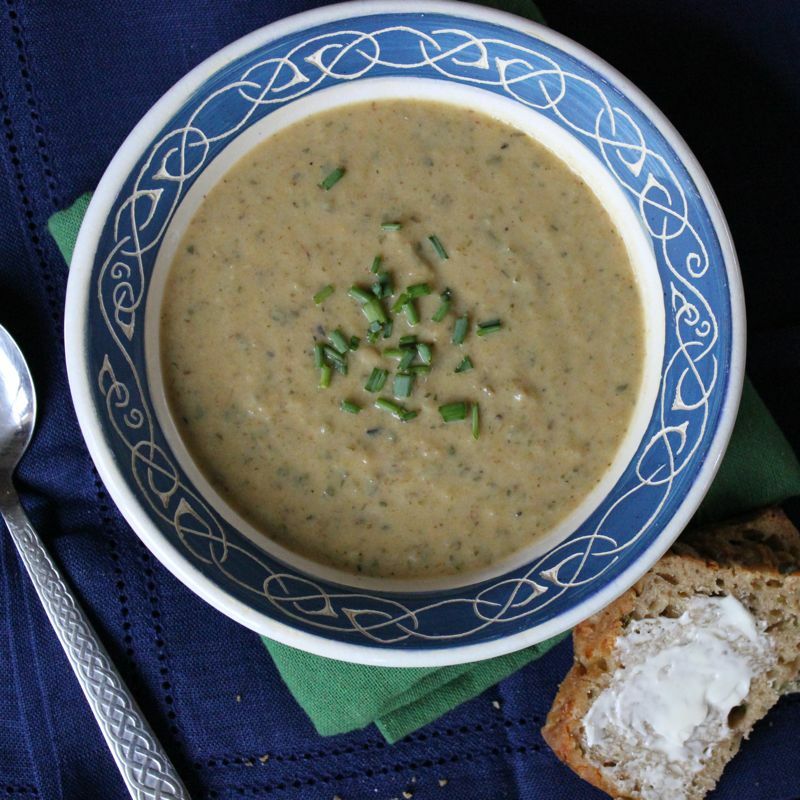 You can serve this soup sprinkled with chives and accompanied with a lovely piece of butter slathered Cheddar & Chive Guinness Bread as I did. Or you could garnish it with some nice crispy crumbled bacon or pancetta. The possibilities are endless. 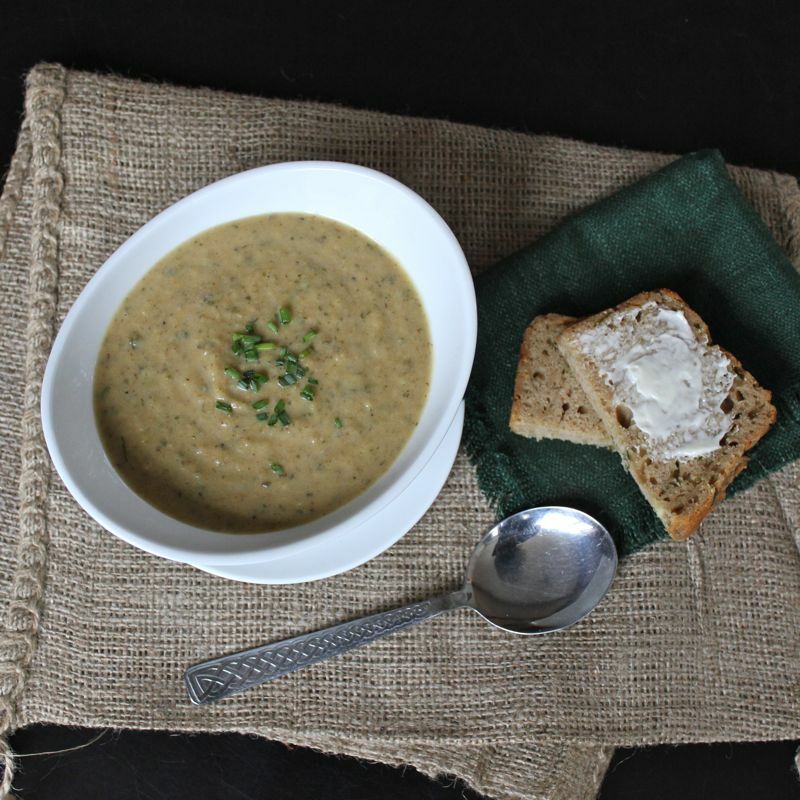 I think I’ll just throw another log on the fire now and tuck in a big bowl of that divine Roasted Potato Leek Soup. Surely Spring is just around the corner! Roast potatoes and leeks in olive oil and pepper at 400° F for 40-45 minutes, or until tender. Add Arugula/Rocket and roast for 5 more minutes. Transfer vegetables to a bowl, adding the wine and 5 cups of the chicken broth. 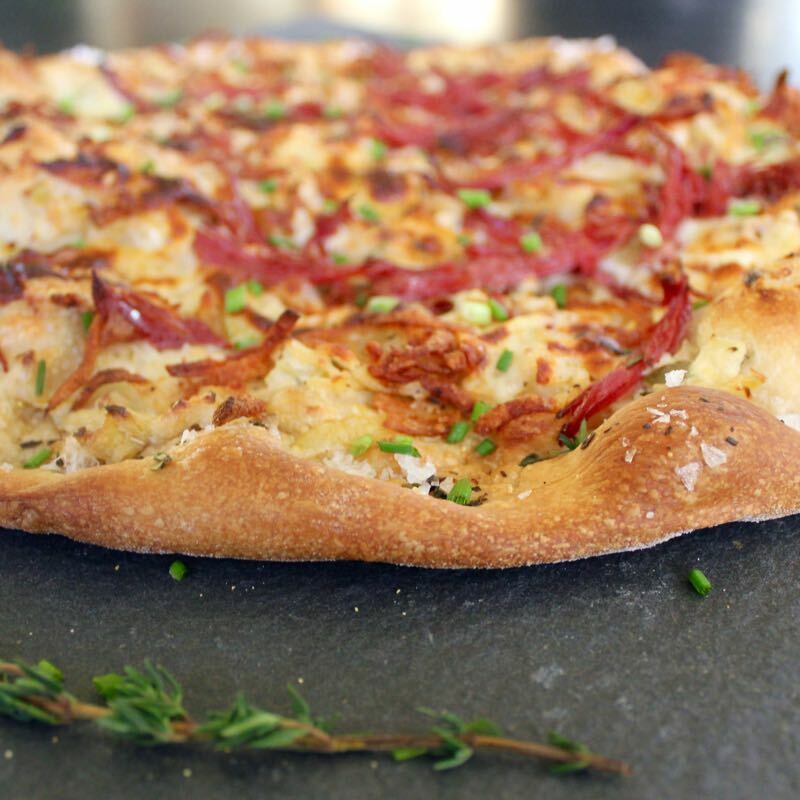 Be sure to scrape the pan clean of all the crispy bits – these add tons of flavor! Puree the vegetables and stock until smooth in a food processor or blender. Transfer to large pot. I actually transferred my roasted vegetables directly to a large pot, added the broth and then used an immersion blender to puree. Add stock until the consistency reaches a thick soup, and add cream and parmesan. Heat, covered until ready to serve. I’m so excited today! For a couple of reasons actually. 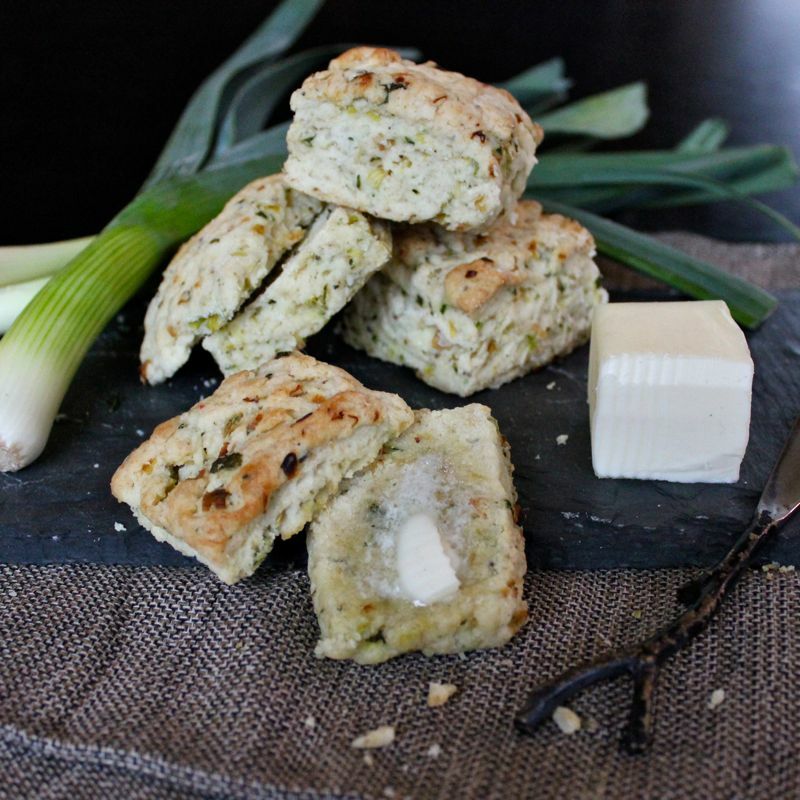 The first of which is that I’m able to give you the recipe for these Caramelized Leek, Basil & Black Pepper Biscuits. These delicious little morsels have been in heavy rotation in my house this winter. 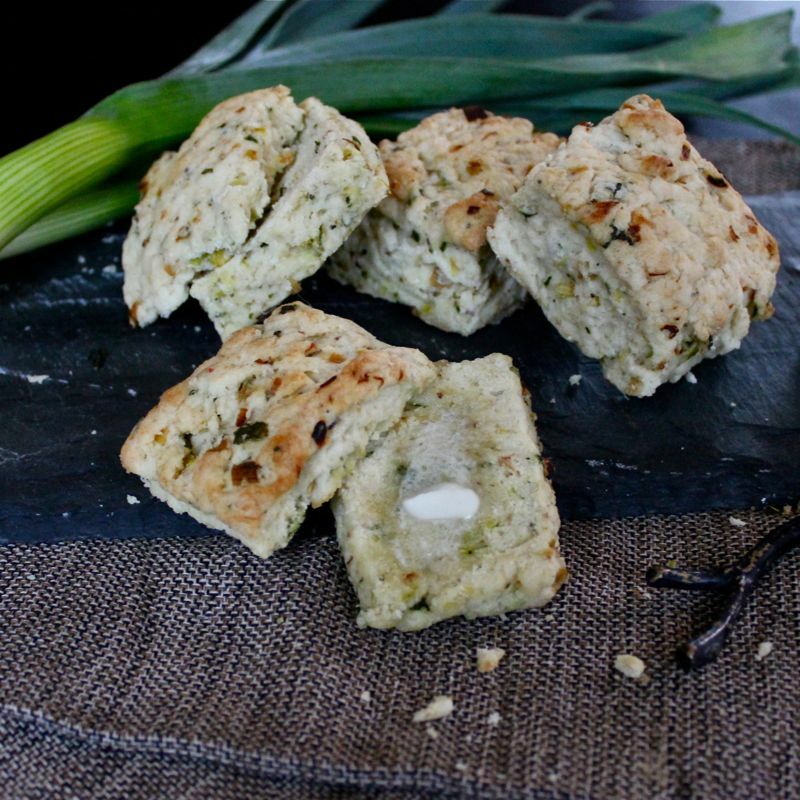 They are amazing with soups and stews, are a superb savoury breakfast biscuit when stuffed full of scrambled egg, cheese and bacon. Not to mention, they hold up fine all on their own with or without a pat of butter. 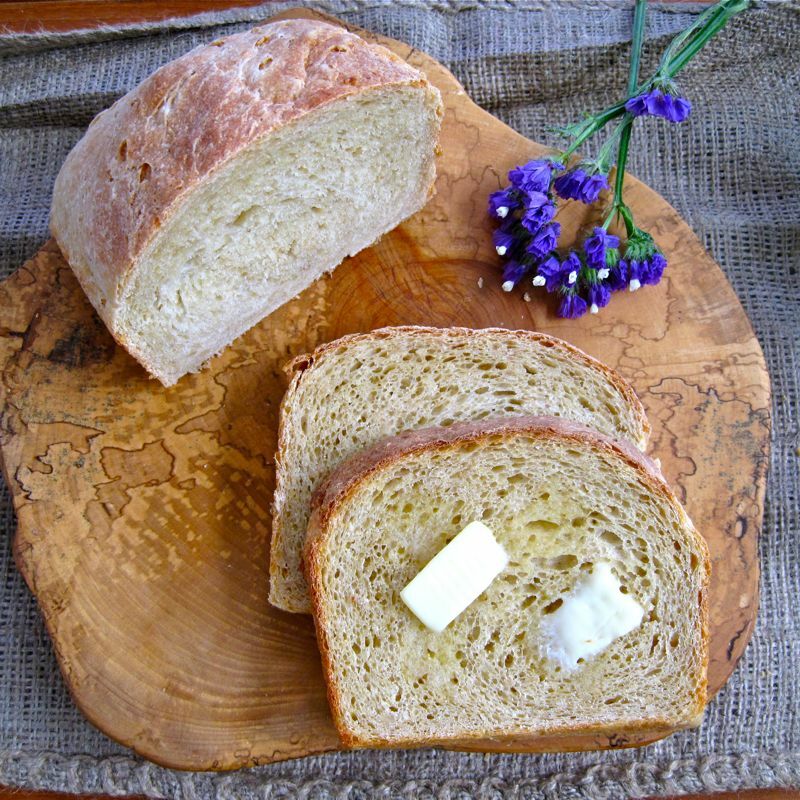 I’ve wanted to share this winner of a recipe with you for some time, but have never been able to snap a quick picture of them. Nope. We literally gobble them up that fast. But this last time, I did manage to click a shot or two before nothing more than a crumb or two remained to indicate they had ever been there at all. These biscuits have it all going on! Their buttery, flaky layers rise oh so high. 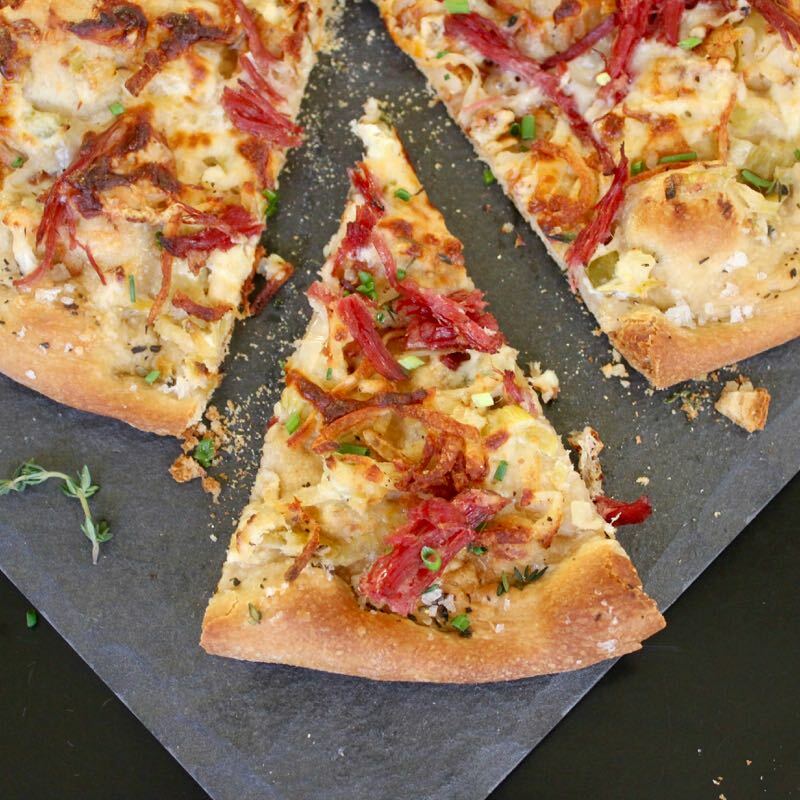 The savoury flavours of the caramelized leeks, basil and black pepper combine to really grab your attention. You know you’re not dealing with just any run of the mill biscuit. (not that I’ve really ever met a biscuit I didn’t like…), these fellows are special. My husband is quite partial to them because of the leeks. He LOVES leeks. 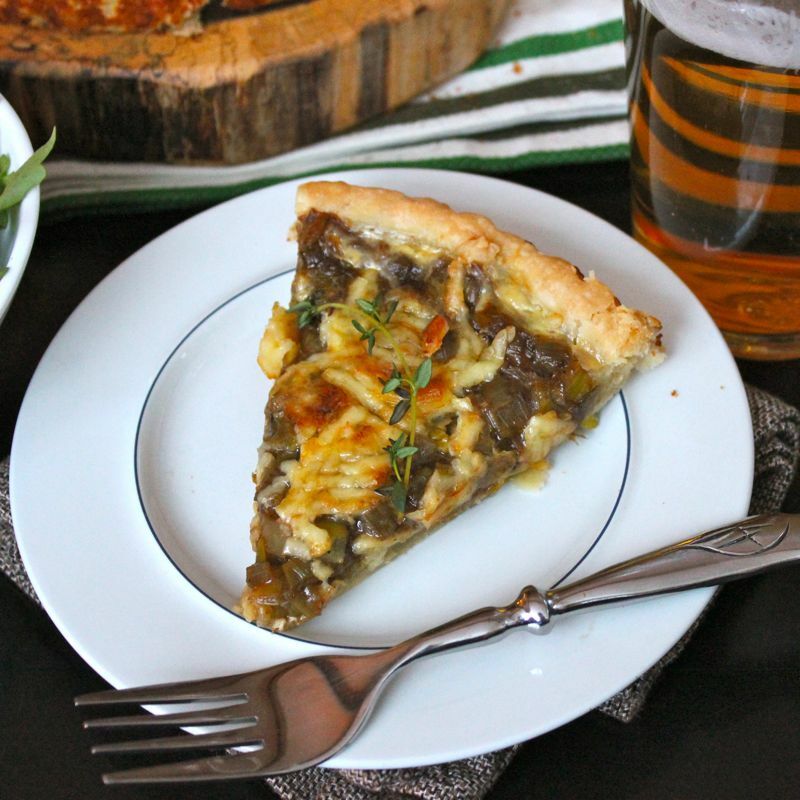 And I’ve actually got quite a few recipes headed your way in which leeks feature prominently. 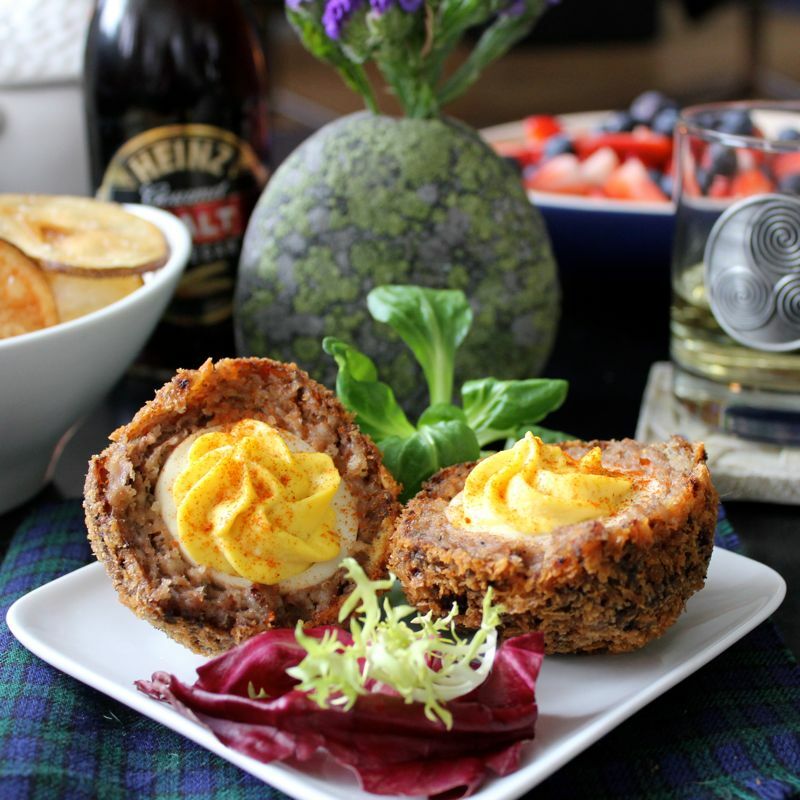 And that was just a few of the St. Patrick’s Day food gems I whipped up. If you’d like to see all seventeen from last year, click on “Runcible Eats/ Recipes” in my top navigation bar and scroll down to St. Patrick’s Day. 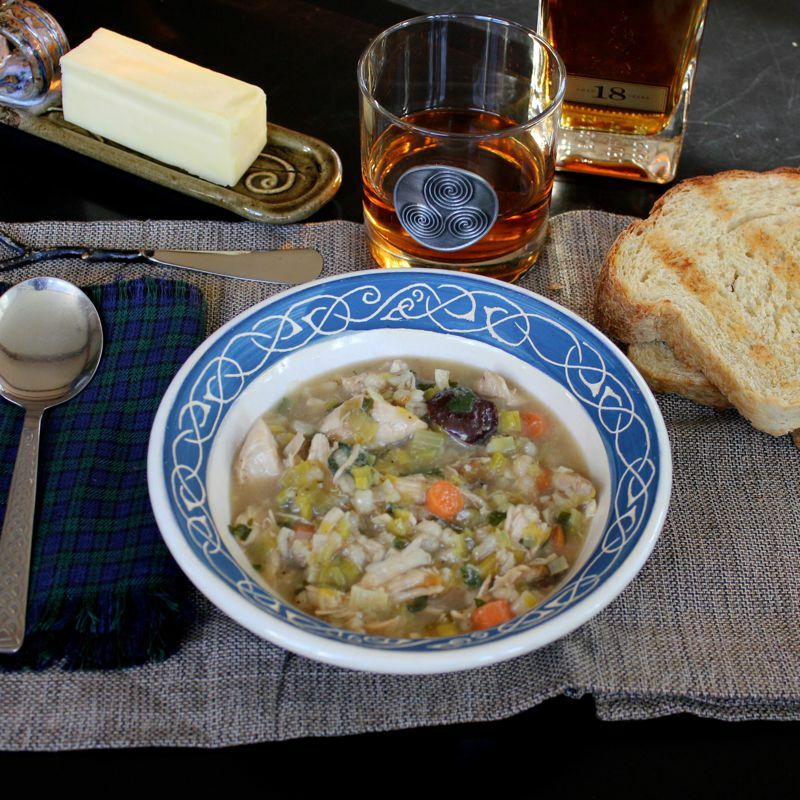 There you’ll find all sorts of Irish-y dishes from the past two years. And don’t forget to check in with me every day starting tomorrow through March 17th for this year’s additions. I’ve got a lot of mouth-watering recipes all queued up for the show. 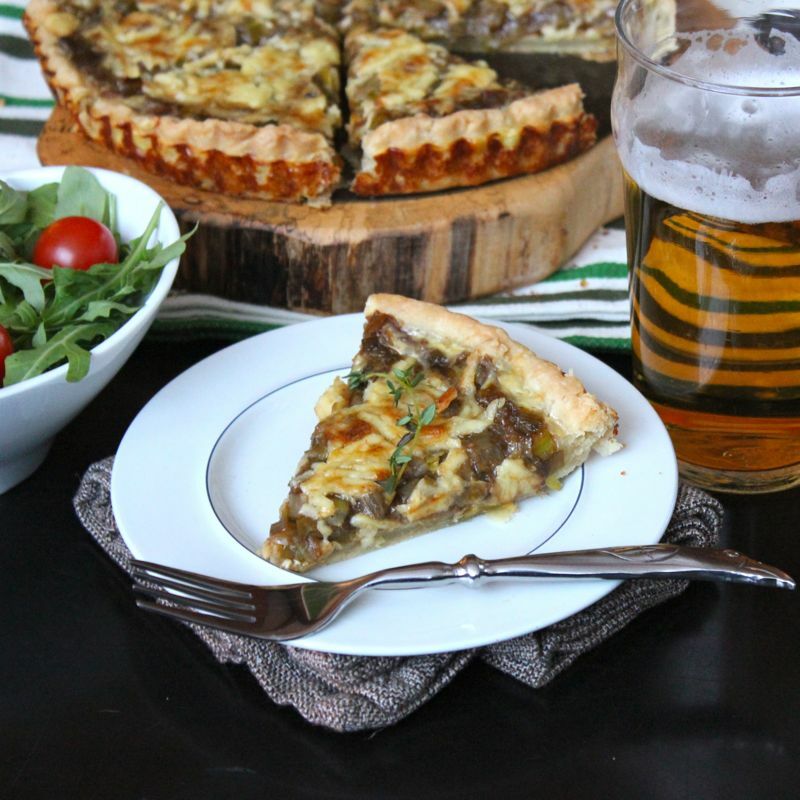 As I mentioned, leeks will be putting in an appearance, as will meat pies, sweet pies, various treats with Guinness and Bailey’s and Jameson...Oh My! 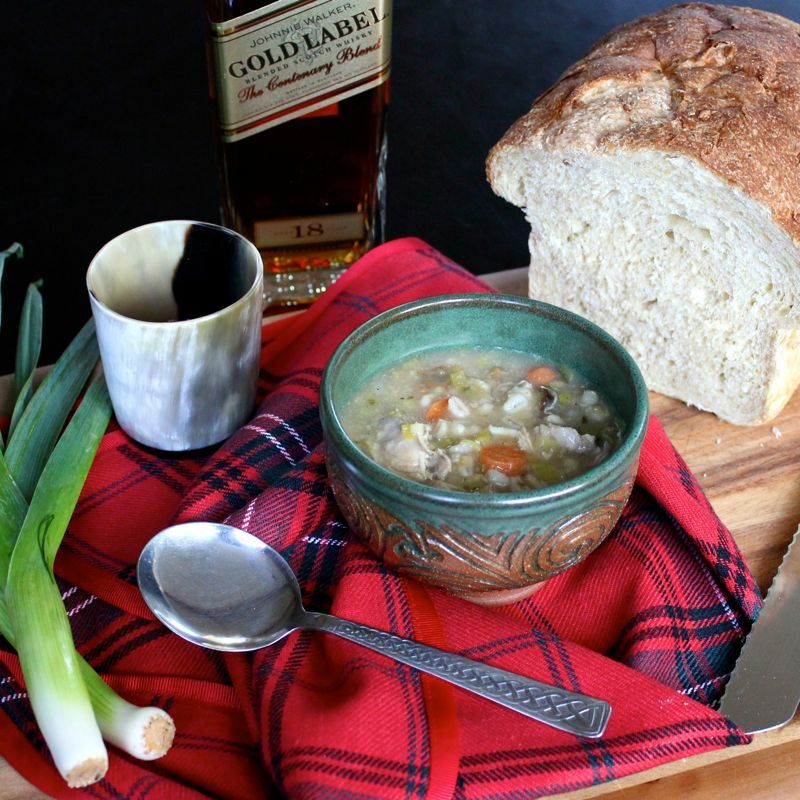 Keep tuned and you will be totally set for making your own delicious St. Patrick’s Day feast! Not to mention, it will be interesting to see if I can actually pull off seventeen days of dishes in a row. That excitement I mentioned before is perhaps more of the nervous, nail bite-y type that the happy, dance-y type. Though I will be dancing a jig on St. Patrick’s Day, regardless of the outcome, you can be sure. So raise a glass with me to “challenges”. It all starts tomorrow. 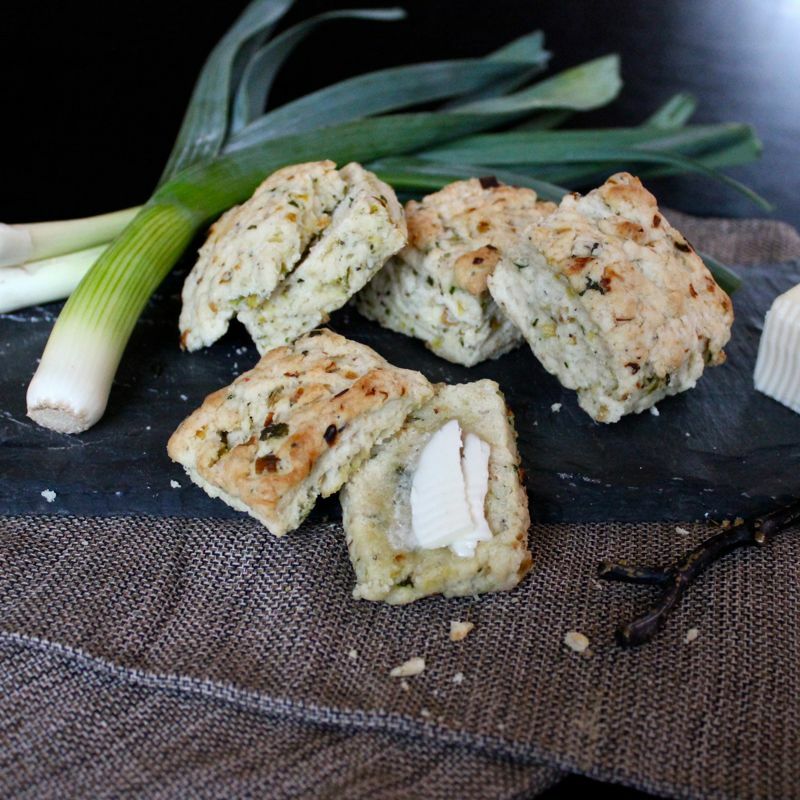 In the meantime, make up a batch of these lovely Caramelized Leek, Basil & Black Pepper biscuits! Preheat oven to 425°F (220° C).